Are We Really Entering the Age of Drone Warfare? Will the ‘drone revolution’ bring about a redistribution of military power in the international system? Over the past few years, academics, journalists and policymakers have become increasingly concerned about drones. In particular, some argue that given that drones are cheap and easy to produce, they will proliferate widely, thus permitting even poor and underdeveloped countries to field advanced military capabilities without the need for the massive military-industrial complex the United States has developed over the past 70 years. If correct, these interpretations suggest that the robotic revolution might promote a realignment in the distribution of military capabilities of the sort that many have been anticipating for a long time. Others have commented that by employing drones for signature and targeted strikes, the United States is setting up a dangerous precedent that other countries are going to emulate once they acquire drone capabilities. The problem with these arguments is that they completely ignore the infrastructural and organizational support required to employ drones. First, learning how to fly and operate combat-effective drones capable of affecting strategic operations takes intense training and resources. Despite its unrivaled experience, the United States still attributes 40 percent of its drone crashes to human errors. Similarly, understanding how to operate drones is extremely challenging, as extensive time and political effort (in order to overcome resistance within the military and government) are required to design suitable organizational structures, and develop appropriate doctrines identifying the optimal allocation of responsibility over the aerial platform among different units, across the chain of command, and between military services. For instance, Israel has been using drones since the 1970s, yet its armed forces truly devised how to fully exploit drone capabilities only after their poor performance against Hezbollah in 2006. 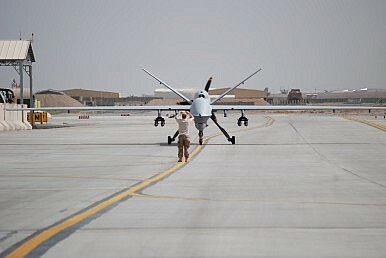 Second, as a report for Denmark’s Center for Military Studies concluded, unmanned aerial vehicles require “a large number of highly specialized personnel to exploit the vast amount of data they can produce.” For example, the employment of a single high-end drone like the MQ-9 Reaper or the RQ-4 Global Hawk calls for 300-600 ground-based, highly skilled personnel in communications, computers, and software. Such resources are scarce, require years of education and practice, as well as complex and expensive training facilities. Even countries like the United States, France, Great Britain, or Germany have struggled to recruit this level of personnel. Given certain inherent limitations as regards technical skills development, many developing nations will necessarily experience even more acute difficulties. Third, drones represent a force multiplier. Thus, translating the intelligence they gather into a marked combat advantage requires complex and expensive C4 (command, control, communications, and computers) architectures along with the support of other military platforms. For example, during the 2003 Iraq War, the RQ-4 Global Hawk could help track and destroy 40 percent of Iraqi tanks by flying 3 percent of the overall surveillance missions. However, without satellites and line-of-sight systems transferring imagery and video intelligence, Combined Air Control Centers (CAOC) processing and distributing data packages to the different deployed assets, and sophisticated jet fighters striking enemy targets, the Global Hawk would not have delivered any tangible advantage. Currently, only the United States possesses such long-range reconnaissance and striking capabilities and inherent costs and complexity makes it seemingly unattainable for most countries, at least for the foreseeable future. For instance, just the cost of a military communication satellite program runs into billions of USD when taking into consideration the required spacecraft, orbital launches, and, in particular, the acquisition and integration of the ground terminals. Bandwidth constraints, radio spectrum availability, and enemy countermeasures pose additional and significant challenges to operations. As such, despite the unrivaled U.S. space capabilities, lack of communication satellites significantly constrain the beyond-the-light-of-sight (BLOS) employment of American drones over particular geographical areas like Central Asia and the Middle East where, currently, U.S. armed forces cannot simultaneously operate more than two RQ-4 Global Hawks. In conclusion, the use of drone strikes will not proliferate. The complexity and the cost of the architecture required for the employment of drones, coupled with the required experience in operating and coordinating a large number of very advanced military platforms, pose significant constraints to the capacity of many countries to use this technology for military operations. It follows that the drone revolution is unlikely to either promote conflict among countries, or to bring about a redistribution of military power in the international system. Andrea Gilli is a Post-doctoral Fellow at Metropolitan University Prague. Mauro Gilli is a Post-doctoral Fellow at Dartmouth College. This article is an excerpt from their recently published paper “The Diffusion of Drone Warfare? Industrial, Organizational and Infrastructural Constraints,” which appeared in the latest issue of Security Studies. Why the 'drone revolution’ will not bring about a redistribution of military power in the global system--just yet. Why India's Drone Policy Needs a RethinkUS Navy Deploying Advanced Surveillance UAVs to GuamIs China Establishing a Norm Prohibiting Lethal Drone Strikes in Asia?Russia Reveals New Flame-Throwing Anti-Tank Multicopter UAV Unmanned 'Killer Robots': A New Weapon in the US Navy's Future Arsenal?